Pro-Ject Essential II Digital brings optical to your vinyl | What Hi-Fi? Award-winning Essential II turntable gets a digital facelift. Pro-Ject has unveiled a new turntable: The Essential II Digital. And it does optical. “The Essential II Digital aims to be the first hi-fi specified turntable that can be connected – out of the box – to any modern home entertainment system,” says the company. There’s a new internal phono stage, which gives you the option of an analogue line level output or a 24-bit/96kHz digital optical output. The analogue part is based on Pro-ject’s existing Phono Box design, while the optical output uses a built-in analogue-to-digital converter. You’ll be able to plug the turntable straight into your home cinema receiver, multi-room system or soundbar. Elsewhere, most of the features from the original (Award-winning) Essential II have been carried over. You get a 8.6in aluminium tonearm, a heavy MDF platter, a low-voltage motor perimeter belt drive system and an Ortofon OM5E cartridge. 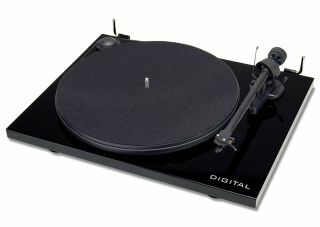 The turntable comes in glossy black or white, and comes with a dust cover. The Pro-Ject Essential II Digital costs £310, and is available in June 2015.